What’s in your cooling tower? Summer brings warmer days and greater demand on the chill-water system. Increased demand for power and water become more manageable by cleaning cooling towers regularly. I was cleaning my truck the other day and ran across a couple of samples that boldly demonstrates what happens if you don’t clean cooling towers regularly. I grabbed these samples from a CT retrofit project earlier this year. The tower’s owner was surprised at how plugged the tower had become. He was budgeting for a new cooling tower to handle the equipment demands for chill water. The tower looked pretty good from the outside but once we opened up, this is what we found. Cooling tower fill is the heart of the tower. The rest of the tower just distributes water and air over the fill and captures cool water for the chiller. Our technicians maintain the support channels so water and chemicals flow, replace missing nozzles to avoid blow-outs and keep the returned water flowing evenly across the fill media. 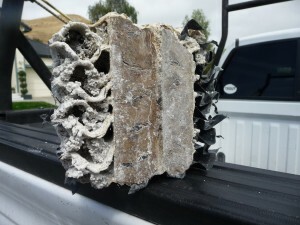 Scale removal should be done whenever buildup is noticed on the air intake louver or at least annually. Scale is either removed during cooling tower cleaning by maintenance technicians or the packing will plug-up as seen in the picture above. “Pay me now or pay me later “is over-used but seems the best way to describe results of poor maintenance. Plugged nozzles are a major problem to tower performance. Nozzles are the most efficient water filter in the system. Manifold pressure increased by plugged nozzles will eventually build to point when nozzles blow out. Then, most of the water will blast through the larger opening created by the missing nozzle and starve the remaining nozzles. Tower efficiency is seriously diminished by missing nozzles. The remaining fill becomes dry, hardening the calcification onto the surface and causing hot-spots. 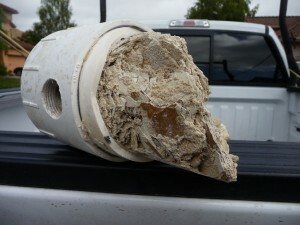 A hot spot is a location in the fill where water is diverted away from a calcified area. This end piece of a manifold was so plugged with calcification that nozzles had blown-out along the other 12 ft. in length. You can see that little water moved through the manifold; in fact, the rest of the manifold was channeled allowing some water to trickle across the fill media but most of the packing had to be jack-hammered out. We replaced the fill, manifolds and nozzles restoring the tower to design capabilities. The additional tower became unnecessary. Water was not being sprayed evenly across the packing media. That led to large areas of fill media being plugged as in the first picture. This deterioration was hidden from visual inspection while the decrease chill-water efficiency gradually declined at the same time as building demand increased. This scaled-up condition could have only been discovered by technicians while cleaning the tower. Cleaning cooling towers saves money monthly by reducing water and electrical demands; while allowing you time to budget for a retrofit 7 to 10 years in the future. Check with us today to find out what’s in your tower.